Who will be the next to make history? A familiar chill to the morning air and the ubiquity of pumpkin spice can only mean one thing: The United States Disc Golf Championship is upon us. And along with this unique event comes some unique coverage. As the collective gaze of the disc golf world shifts to South Carolina, our staff has decided to log its picks — some conventional, others not so much — for posterity. We’ll take a look at those players who could shock the world at Winthrop Gold, as well as boom or bust prospects who could wow or wither. We’ll even go so far as to choose who is the safest bet for a top 5 showing. All roads, though, end here, with our choices to stand atop the podium Saturday evening as the newest United States Disc Golf Champion. It’s just too difficult for me to pick against a determined Ricky Wysocki right now. If you think he doesn’t have his third place finish at last year’s USDGC — he was a handful of strokes out when Hurricane Matthew reared its ugly head and canceled the final round — or his second place heartbreak from 2015 etched into his brain, then you don’t know the reigning PDGA World Champion. This is the one Major that has eluded him to this point, and it’s the one Major that will firmly entrench him as this era’s 1b alongside Paul McBeth. Combine the uncertainty surrounding 1a’s recent back injury with Wysocki being knocked from the top of his Green Mountain Championship pedestal, and there just isn’t another pick that makes more sense. I’ve been chewing on my pick for a few days now. I’ve found it difficult to pick a winner this year, a sign of just how much parity we’ve seen this season. No more does it feel like Paul McBeth or Ricky Wysocki holding a trophy is an inevitability. I’m rolling with Eagle McMahon. It’s easy to remember the disaster that was last year’s third (and ultimately final) round, when he took a 10 on the par four 13th. But what if that first shot just skipped a little cleaner and made it safely out of the parking lot? He’s up three strokes heading into that hole. He would have picked up at least one stroke on eventual champion Jeremy Koling, who bogied. It’s easy to forget that Eagle was dominating the course for 80% of the tournament. He knows how to play Winthrop Gold. He’s ready for his moment. 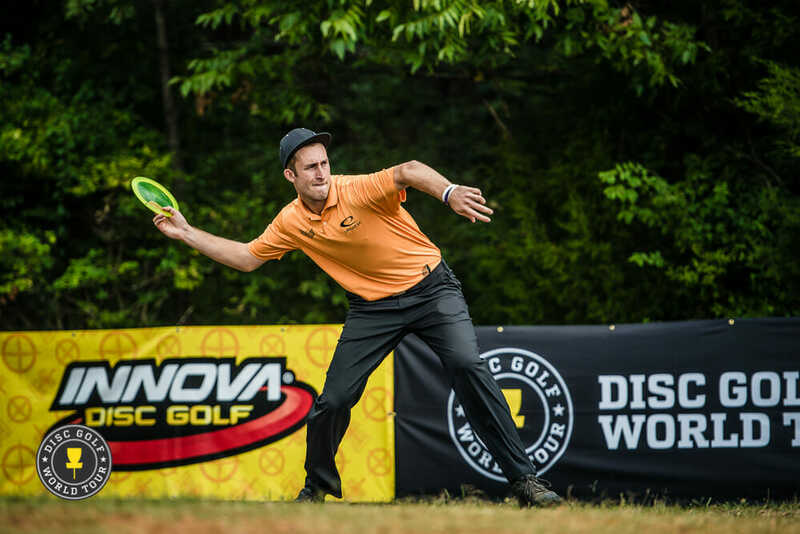 Ricky Wysocki has been a bit up-and-down since his win at the PDGA Pro World Championships, and he’s had some up-and-down finishes at the USDGC — he’s placed second twice, but has also thrown in 43rd and 76th place showings — throughout his career. But he’s been more up than down at Winthrop Golf lately, and he looked poised to make a run at the win in last year’s hurricane-shortened event. It feels like about time that he wins the PDGA Major he doesn’t yet have. Although we saw Ricky Wysocki “struggle” a bit after winning Worlds this year, I think he is ready to push for the win at USDGC. It’s in the par 4s: If he keeps up his pace of averaging 3.43 strokes on those holes (using UDisc Live data), Wysocki will set himself up well for attacking Winthrop. A 3.43 average on the USDGC par 4s, with a clean sheet elsewhere, will put his score around 61 in the par 66 layout and 62 on the par 67 layout. The average winning score per round the last two years? 60.3. Capitalize on a couple par 5s or 3s, and he’ll have a legitimate chance for the win. When you turn the dictionary to the word competitor, there is a picture of Paul McBeth. One of the fiercest players on tour, look for McBeth to have a big come back from last year’s letdown at Winthrop, where, in uncharacteristic fashion, he finished 20th and went out of 2016 with a whimper. There is no doubt that performance is still on his mind, and internet chatter about the validity of his recent back injury will only add fuel to the fire. McBeth might have the biggest chip on his shoulder of any competitor in this event, and that is a scary thought. If his back holds true, do not be surprised to see him become a two-time USDGC champion. When I arrived late on Sunday in Rock Hill and headed down to see the course at Winthrop, K.J. Nybo was the only one out there still practicing…in the dark. Guys who put in the long hours and extra shots on a course have a tendency of winning. Here’s to you, K.J. TAGGED: DGWT, PDGA, 2017 Disc Golf World Tour, 2017 United States Disc Golf Championship, 2017 USDGC, 2017 USDGC presented by Savage Apparel Co., K.J. Nybo, Paul McBeth, Ricky Wysocki, USDGC Picks, USDGC Picks presented by Savage Apparel Co. Comments on "USDGC Picks: The Champion"